Our sweet Delilah and Keeper have passed away. This is Bridgit, photo by Lynn Butler. 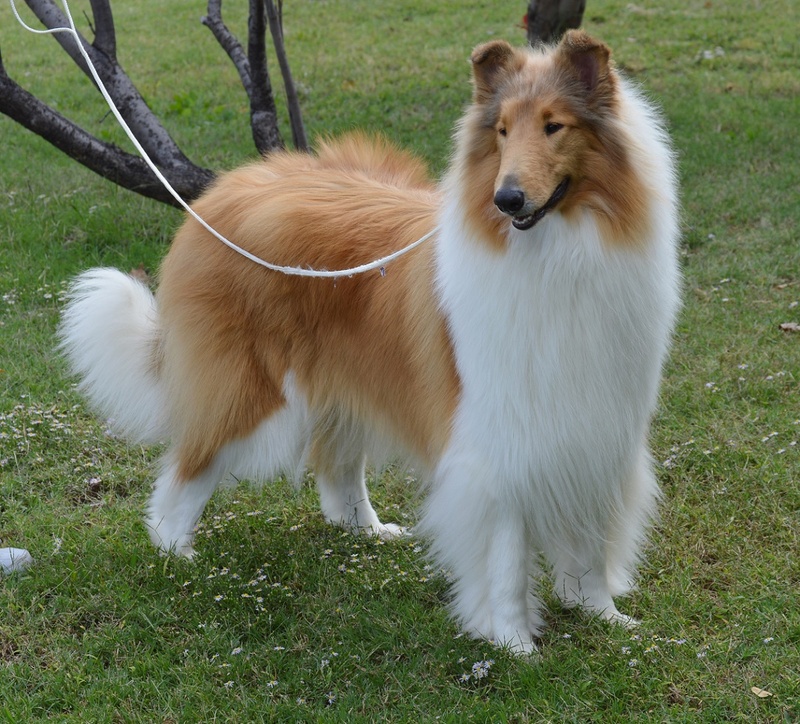 Our beautiful Ch Milas Madam Butterfly was bred by Milas Collies and is co-owned with Lynn Butler. Bridgit is a dream come true. 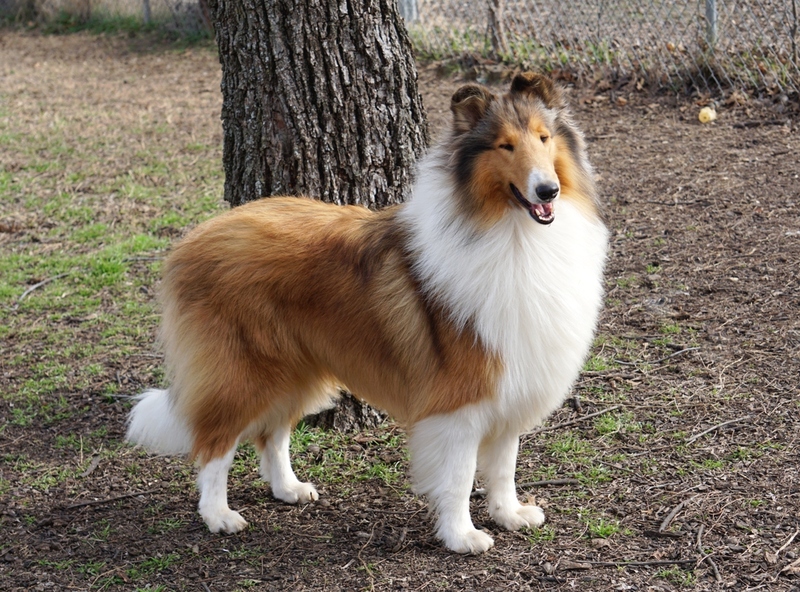 She is a sweet, happy, beautiful collie. She is a daughter of Ch Overland Allstar, out of Ch Milas Latin Diva. Bridgit is a double Macho grandaughter. She seems to know how pretty she is- being a little bit of a diva. She is our alpha girl- full of self confidence, and utterly charming. 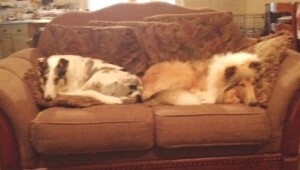 Bridgit and Melly taking it easy. This is our smooth champion Melody! 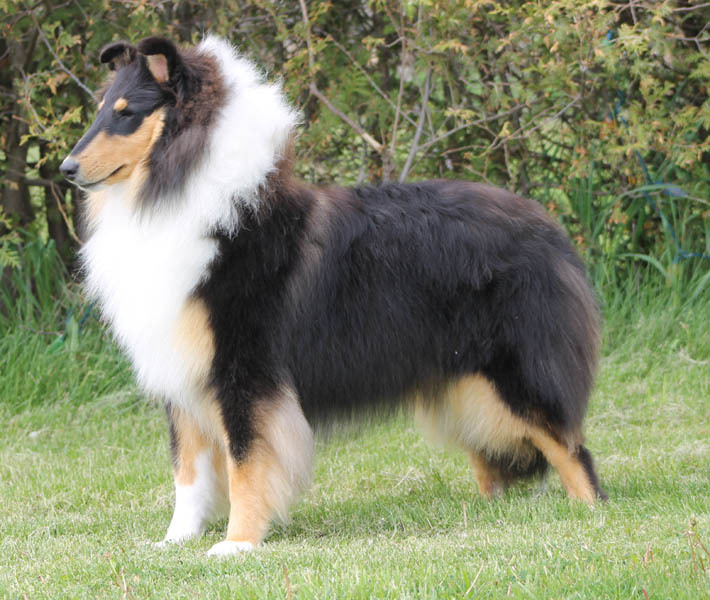 Ch Cherann’s Tairis So Melodramatic is our little powerhouse smooth girl bred by Cheryl Kobularcik. We co-own Melody with Cheryl. Melody is special in all kinds of ways. She is elegant, very sound, and is quite a character. Her name is right on. She should get an Academy Award for some of her performances. I love our collies and feel blessed to have these wonderful dogs in our lives. 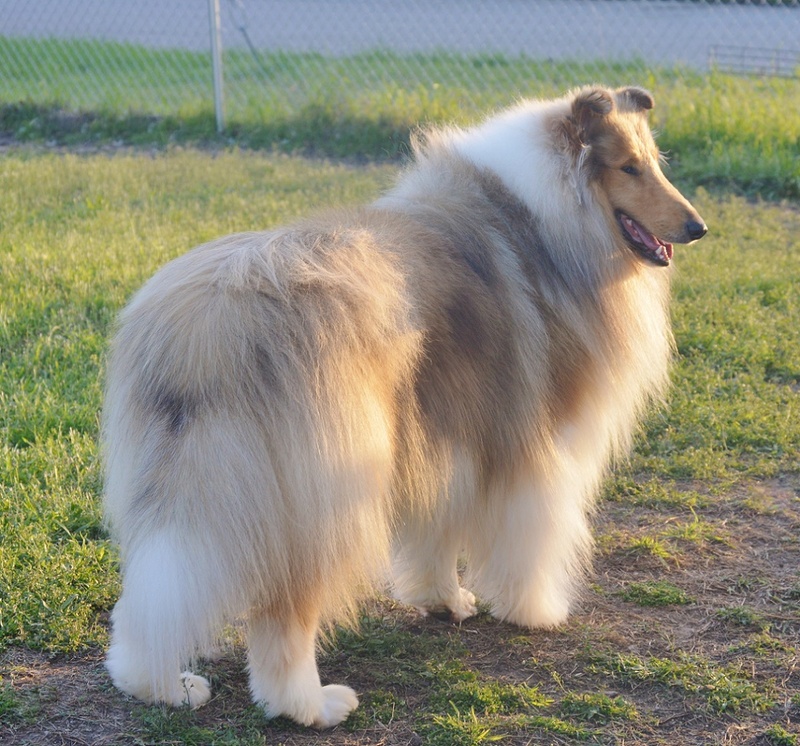 Layla, aka- Cherann’s N Tairis Share the Luv, is our beautiful tricolor bred by Cheryl Kobularcik and Susan Joslin. I co-own her with Cheryl. Layla is a daughter of Miguel (Ch Cherann’s No Stranger To Luv) and Marty (Ch Alcor With A Twist.) We love her elegance and sweet nature. She is close to finishing her championship with only a few single points to go. We hope to have pretty puppies from Layla in 2019. Poppy, aka- Ch Tairis A League of Her Own, is a daughter of GCHS Aurealis Endeavor and Ch Milas Madam Butterfly. Poppy is a big, exhuberant, sable girl full of fun and mischief. 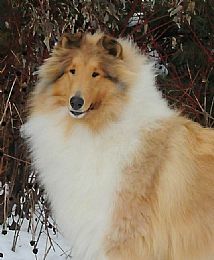 She finished her championship quickly, and then had a beautiful litter sired by GCHS Scalloway’s Lion Hunter (Samson). We kept three of her puppies as show prospects, and they did very well. All three finished their championships before they were two years old. 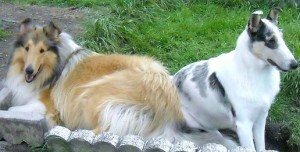 In fact, two of her pups won best in specialty shows as yearlings. The three Poppy/Samson puppies were all shown by Lea Bertsch, who is their co-owner. We hope to have puppies from Poppy again in 2019. 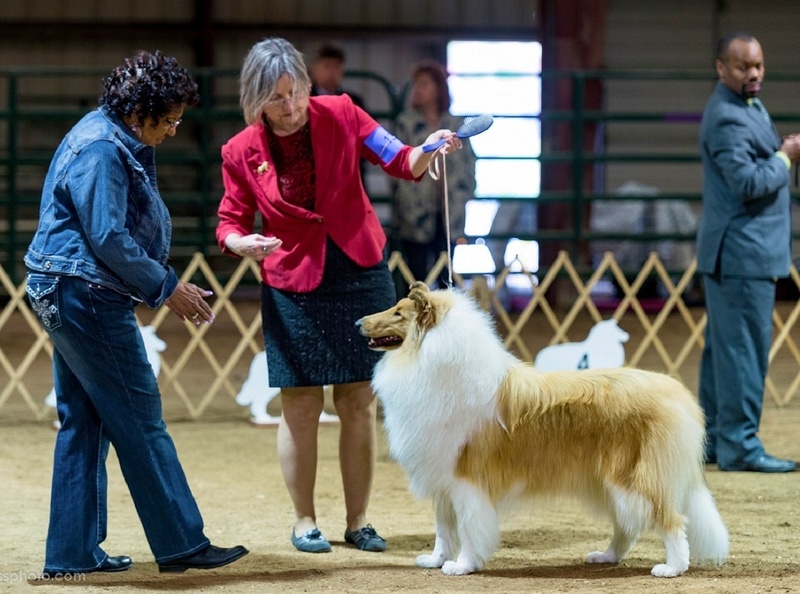 After winning best in specialty at the Saturday Collie Club of Austin show, Patton took a backseat to his sister Willa who went best in specialty the next day under Maret Halinen. We love this big, goofy boy who resembles his mother but is much more laid back. We hope he will be siring some puppies for us in 2019. 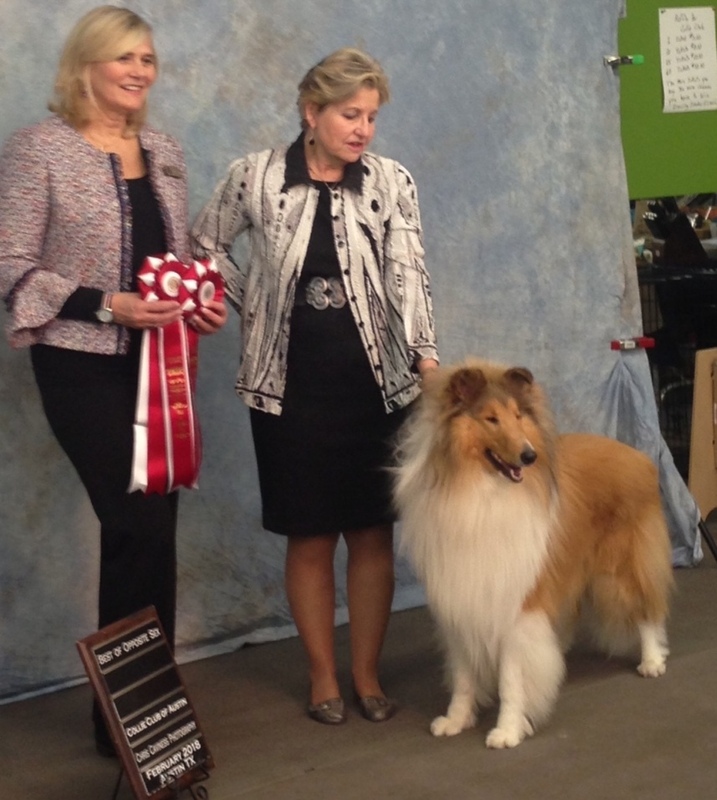 Willa after winning best in specialty shown by Jennifer Harper. 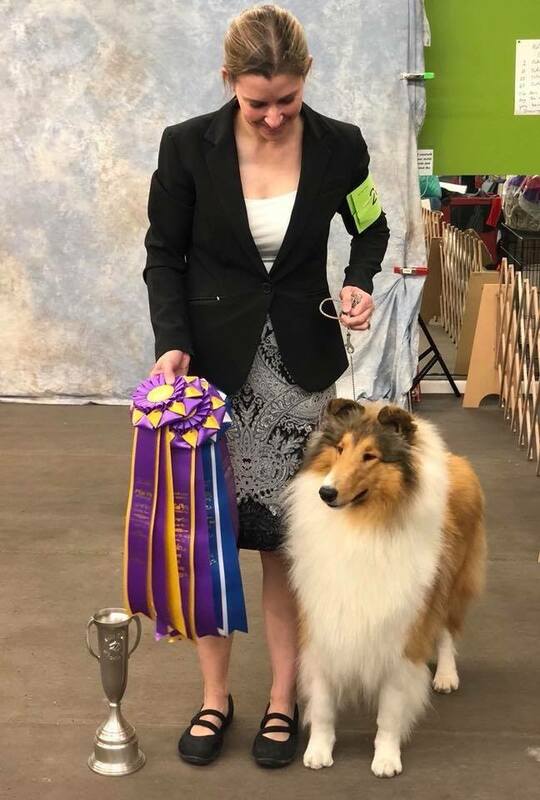 Willa gave us a huge thrill by going best in specialty her very first time shown under breeder judge Maret Halinen at the Sunday Collie Club of Austin show. 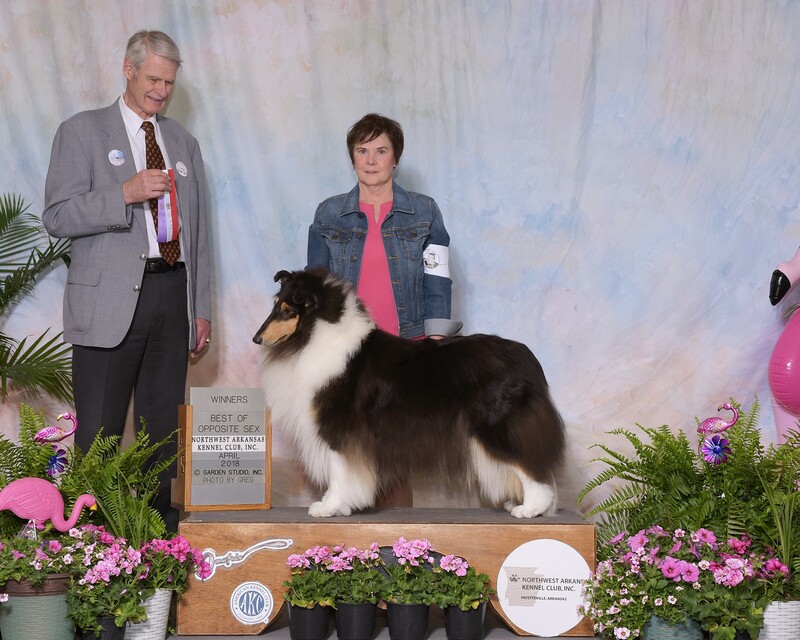 Willa finished her championship, quickly followed by her grand championship. 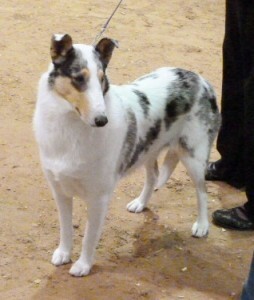 She also got a herding group 3 placement from the classes. 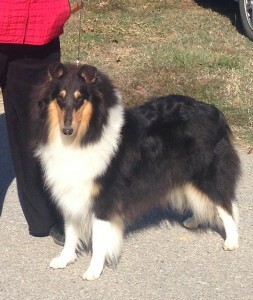 Willa really shines on the move like her handsome sire GCHS Scalloway’s Lion Hunter. 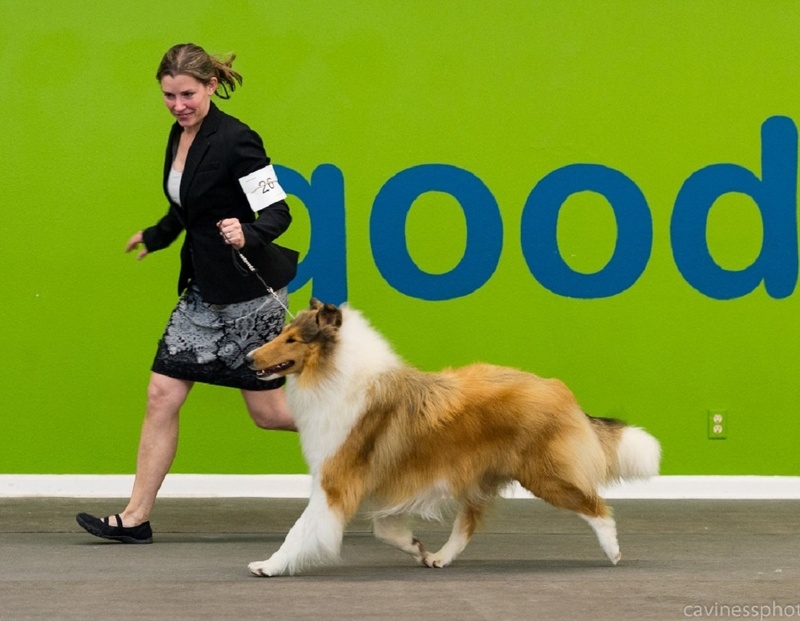 I love seeing a collie move with elegance and soundness. Maxi , aka- Ch Tairis Perchance To Dream At Scalloway also finished in 2018. She has a beautiful face and also finished her championship handily. 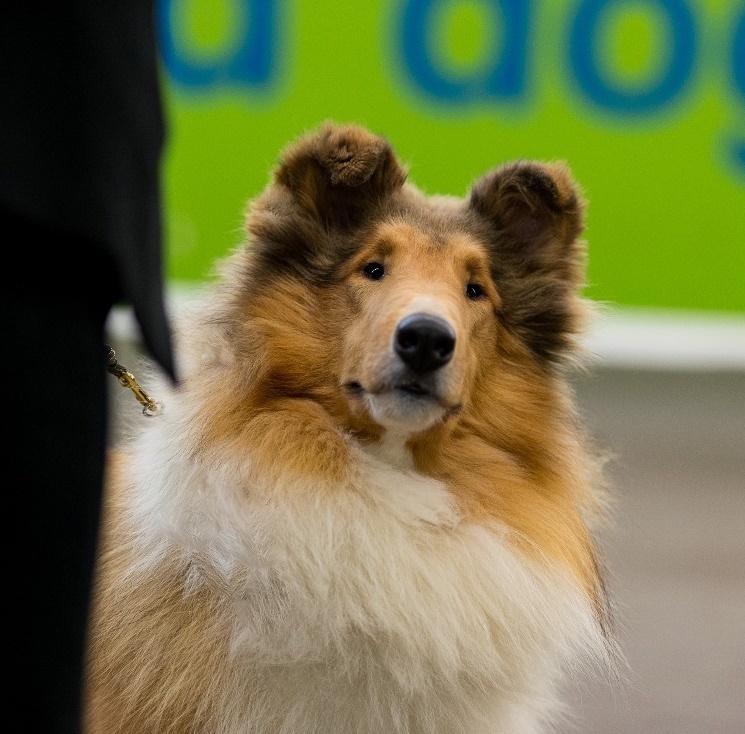 Maxi mainly lives with her co-owner Lea Bertsch who showed Maxi to all her points. We are so pleased with Maxi, Willa and Patton from the Samson/Poppy litter. Tracer getting ready at the Denton show. Tracer, aka- Cherann’s N Tairis Time N Again is a beautiful daughter of Ch Wyndlair Cherokee Exclamation and Cherann’s No Stranger To Luv. Tracer excels in type and sweetness, but is not overly fond of dog shows. 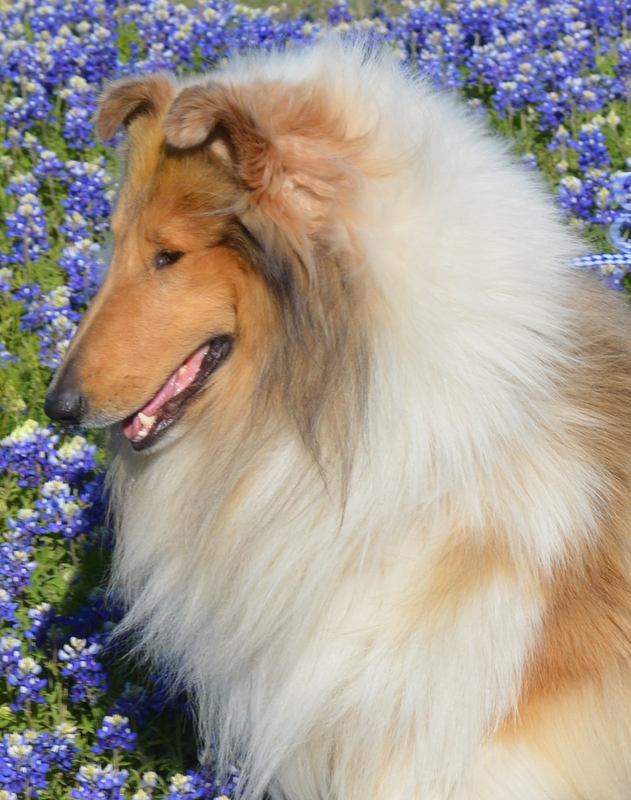 Her gorgeous brothers are carrying the show banner for Cherann’s Collies. Landon- aka- Ch Cherann’s Cherokee on Sacred Ground is breathtaking, as is their tricolor brother- GCH Cherann’s Thunderation. 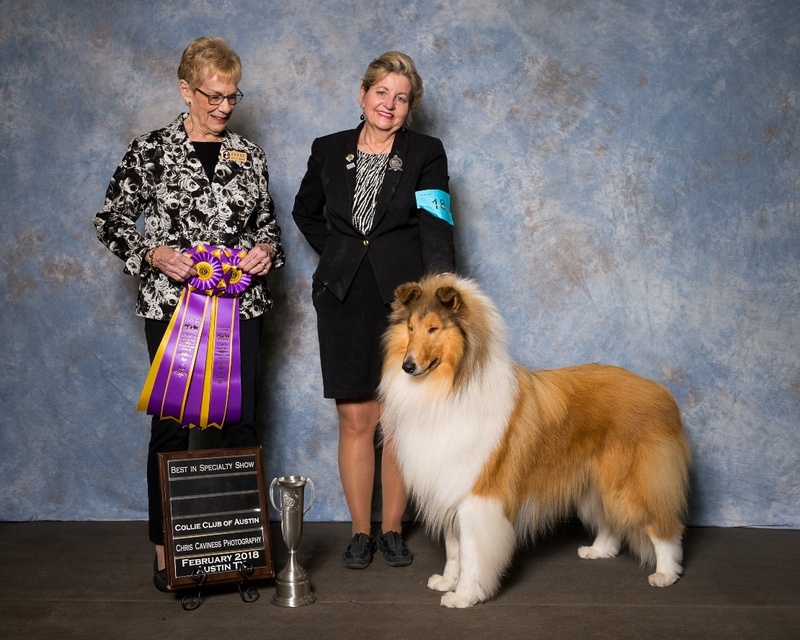 We co-own Tracer with Cheryl Kobularcik, of Cherann’s Collies. Merci, aka Milas Bluecloud’s Desire is a very sweet and pretty girl we co-own with Nancy Weber. Merci is a daughter of the beautiful GCHS Aurealis Coldplay, and Milas Enchanted Music. Her favorite thing is napping on the couch with us. 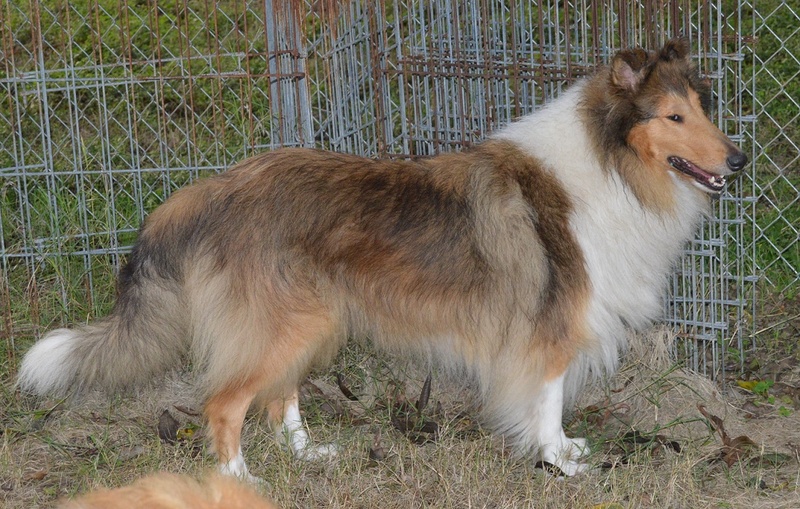 Castle, aka- Ch Monarch Cornerstone, is a big, sweet, handsome boy from Monarch Collies in Washington State. He is now semi-retired and living with a great family near us. 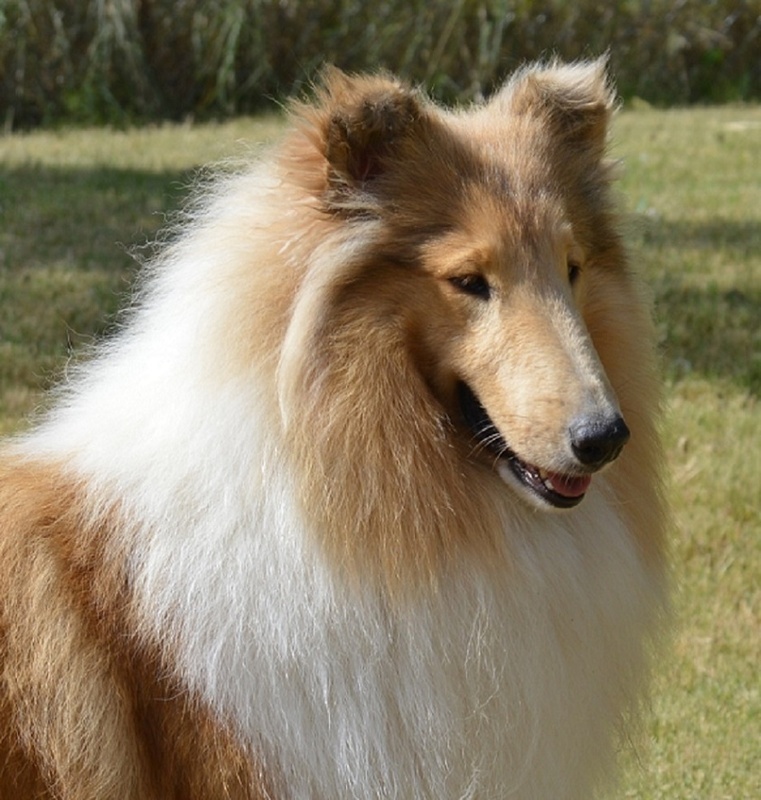 Carina is the beautiful girl we obtained by leasing one of our favorite collies- Ch St. Roch’s Moonlight Serenade, who was bred to Bridgit’s son- Ch Avalar Tairis Autumn Gold. Carina was not fond of showing and had some difficulties with her only litter. 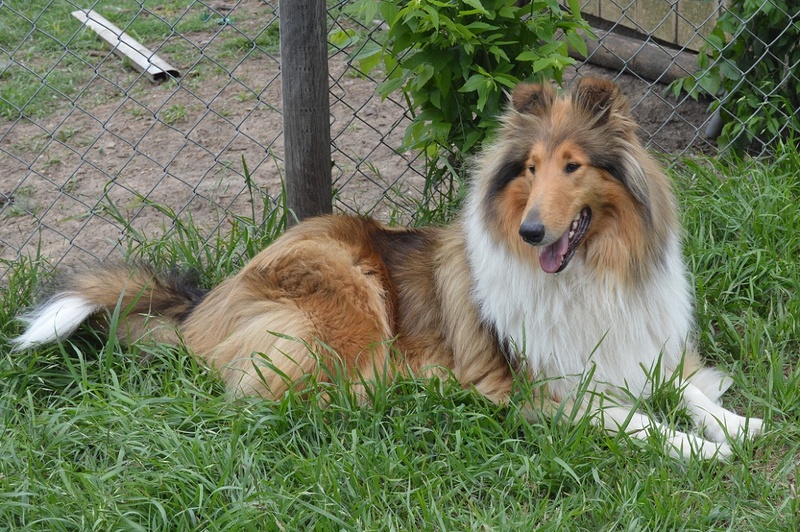 Carina was placed in a perfect home in our area with her aunt- one of Bridgit’s daughters. It was hard to let Carina go, but I know her owner loves her as much as we do, and she is happy there. 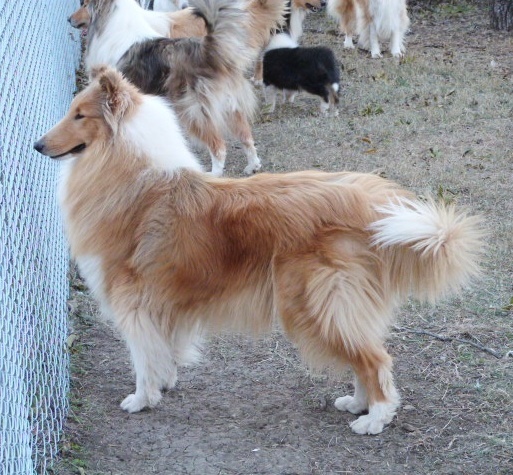 Allison is a sable beauty from Bridgit’s first litter by Miguel. Allison’s is a heartbreaking story I can’t really tell. She left us as a pup and when we got her back later her opportunity for showing was past. Allison’s story does have a happy ending though. She lives with an active, retired couple that take her everywhere on their RV adventures. 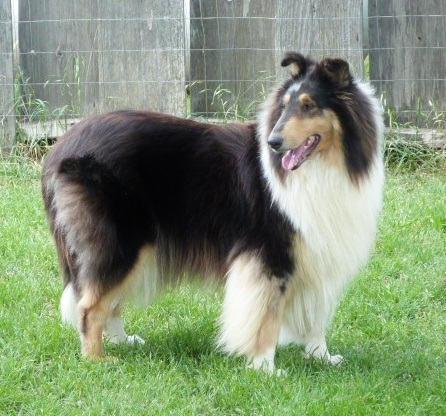 Onyx- aka- Glasgowhill Midnight Onyx is a normal-eyed, tricolor beauty from Glasgowhill Collies in Canada. Onyx liked me and my daughter, but never warmed up to my husband or son. We were able to retire her locally in a wonderful home. Stormy, – aka- Cherann’s Cryptic Storm- is a lovely girl as sweet as they come. She was called Cryptic Storm because she looked like a tricolor with only a couple of small blue patches that made her a merle. I just loved this girl. She had a litter by Lakewind’s Bend It Like Beckham. We didn’t get show winners in the litter, but everyone that got a puppy was super happy with the temperaments. One special tricolor girl went to Kristin Parma and has become a performance star. Kristin named her girl Czechout Calamity Jane. Kristin and Jane have so many titles I can’t keep up with them. It seems Jane conquers everything she and Kristin take on. 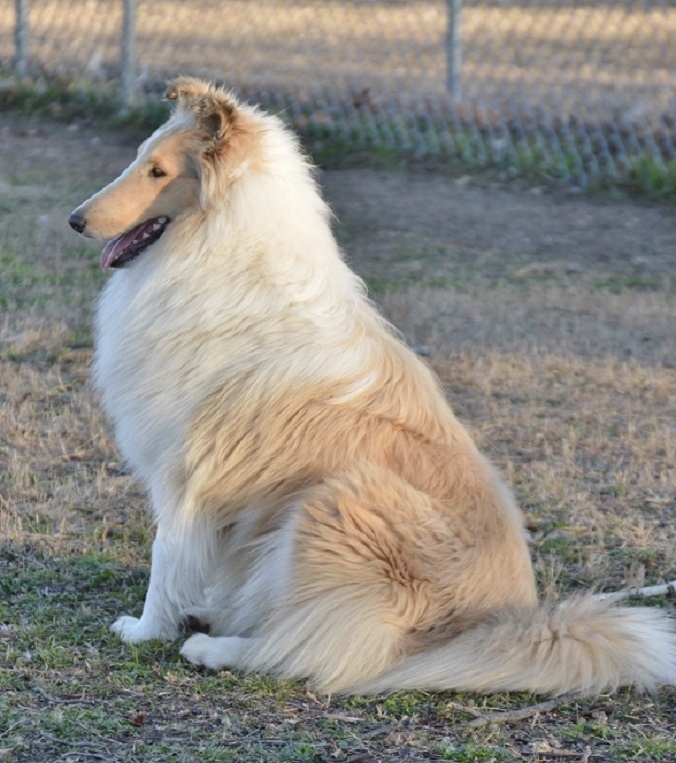 She has numerous agility titles, some obedience titles, a herding certificate and even passed the Barn Hunt test. 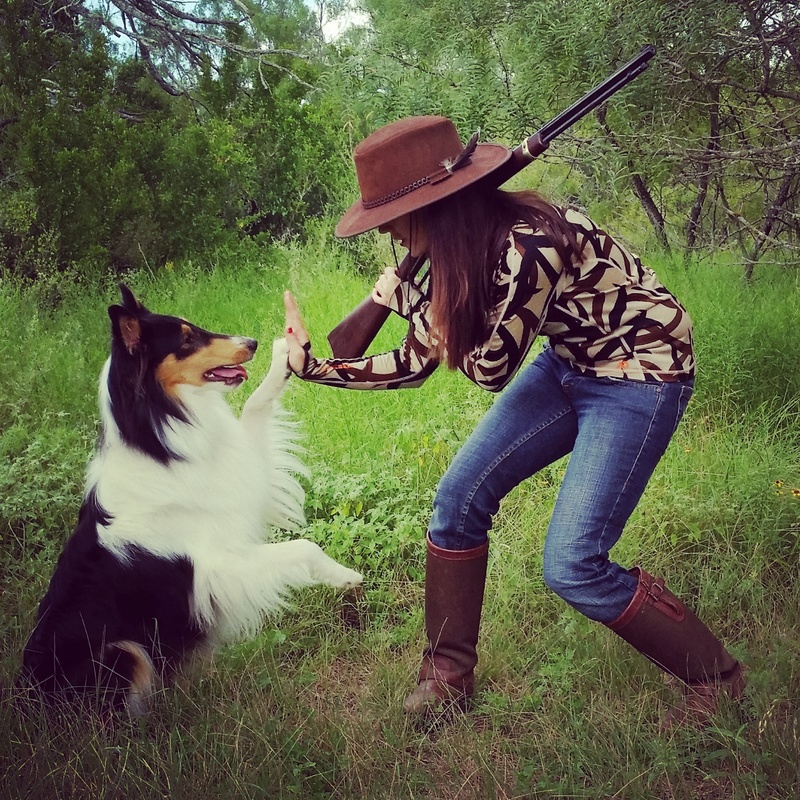 On more practical matters it seems Jane makes herself useful on the Czech Out Ranch with various duties although I think her friendship with Kristin is her favorite task. 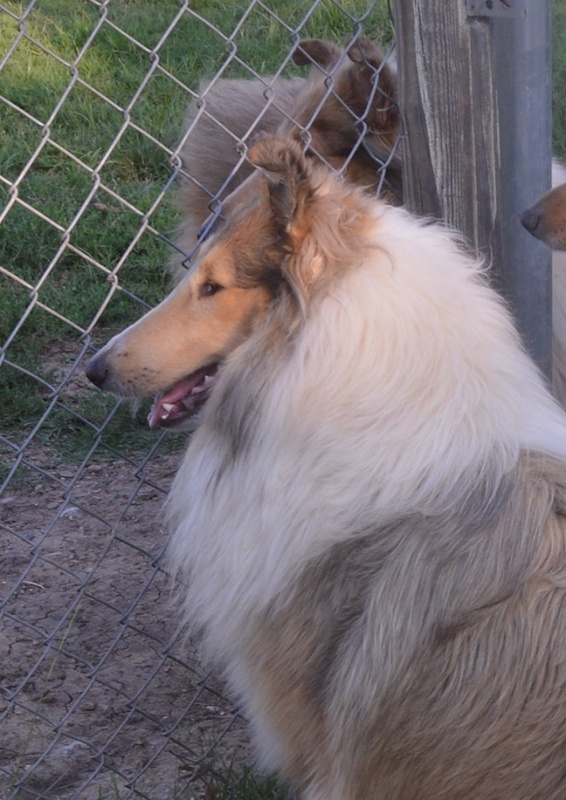 Stormy is such a sweet, soft tempered girl that our rowdier collies tended to bully her. It was a problem that was resolved when one of the vets at the clinic we used met Stormy. The vet and her family fell in love with Stormy. Now Stormy reigns as queen of the vet’s home.